This is an old shot from 2008. After ButterflyCircle member Sunny Chir spotted a colony of the Common Red Flash at an open field, many of us took the opportunity to go out to that location to get a good shot of this species. Common Red Flash males have a favourite time of the day where they 'dogfight' and then stop to open their bright red wings to sunbathe in the hot sunshine. However, it is a great pity that the site where the species frequented is now a large parking lot for lorries and industrial vehicles. I headed out to the site on a sunny Sunday afternoon, and was fortunate to see a few male Common Red Flash flying rapidly amongst the shrubs and tall grass. This individual was particularly acrobatic, and stopped regularly at the tips of a few favourite lallang blades. The challenge was to approach it quickly enough before it took off again to dogfight with the other males. The breezy conditions did not help either, as many macrophotographers would attest, especially when trying to shoot a butterfly that is not much larger than a 10-cent coin! The slightly shady conditions where the butterfly perched made it necessary to rack up the ISO to 1600 and with an aperture of f/10, I managed to get a decent shutter speed of 1/320s to help freeze the moment. After blasting off a series of shots, the butterfly returned again and again to a few favourite lallang perchers. 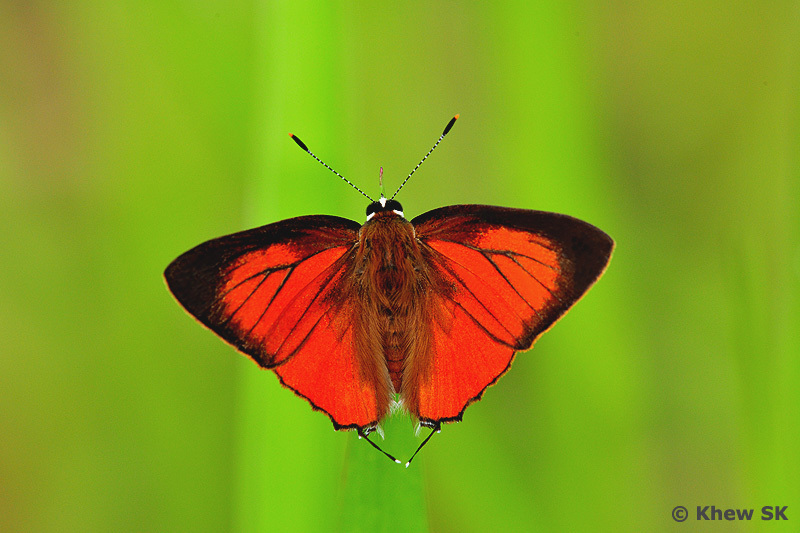 One of the subsequent shots made it to the cover of the recently-launched Field Guide to the Butterflies of Singapore book - featuring this Little Red Dot. This shot was one of several that I like, because the Red Flash perched almost at the tip of the lallang, and with the background of other lallang blades wafting in the breeze, it made the butterfly appear almost like in open-winged flight, suspended in space with a surreal background.